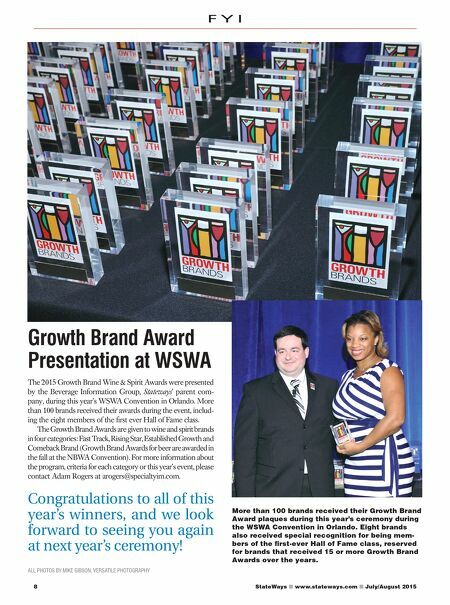 StateWays n www.stateways.com n July/August 2015 8 Growth Brand Award Presentation at WSWA The 2015 Growth Brand Wine & Spirit Awards were presented by the Beverage Information Group, Stateways' parent com- pany, during this year's WSWA Convention in Orlando. More than 100 brands received their awards during the event, includ- ing the eight members of the first ever Hall of Fame class. The Growth Brand Awards are given to wine and spirit brands in four categories: Fast Track, Rising Star, Established Growth and Comeback Brand (Growth Brand Awards for beer are awarded in the fall at the NBWA Convention). For more information about the program, criteria for each category or this year's event, please contact Adam Rogers at arogers@specialtyim.com. Congratulations to all of this year's winners, and we look forward to seeing you again at next year's ceremony! 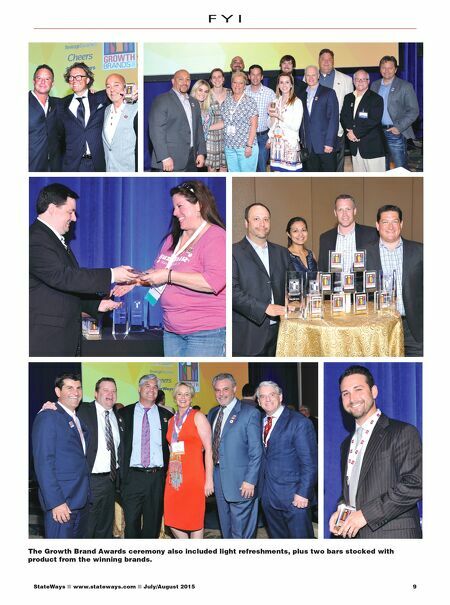 ALL PHOTOS BY MIKE GIBSON, VERSATILE PHOTOGRAPHY F Y I More than 100 brands received their Growth Brand Award plaques during this year's ceremony during the WSWA Convention in Orlando. Eight brands also received special recognition for being mem- bers of the first-ever Hall of Fame class, reserved for brands that received 15 or more Growth Brand Awards over the years.